Frontiers of the Roman Empire (Austria) is part of the Tentative list of Austria in order to qualify for inclusion in the World Heritage List. The Danube Limes was the Roman military border along the Danube. The Romans here used the river as a natural boundary: there was no boundary wall such as for example the Hadrian's Wall in northern England. This 'border' consisted of a series of defense towers, auxiliary forts and larger legionary fortresses. The Danube Limes is nominated to become a WHS in 2019. It will be an additional site to the existing Frontiers of the Roman Empire WHS, not an extension of it. The nomination includes no fewer than 164 locations in Austria, Germany, Hungary and Slovakia. And for 2021 an extension into Bulgaria, Romania, Serbia and Croatia is already scheduled. The rationale behind this is explained as: "Unlike the Roman monuments already inscribed, the ... constructions are evidence from the edges of the Empires and reflect the adoption of Roman culture by its subject peoples." From the sparse remains that are left of this border, I visited those in the Austrian town of Klosterneuburg. It lies half an hour drive from the airport of Vienna and thus was a nice ending of my WHS weekend in Czechia. Approaching in my rented Opel Corsa, my navigation app suddenly showed a 'ferry crossing'. Klosterneuburg lies on the 'other side' of the Danube and there is no bridge in the area. So I reluctantly took the third spot of four that the car ferry can transport - at least it gave me a feel for the width of the Danube again. The Roman remains are located under the Klosterneuburg monastery. That monastery is located on a prominent hill in the city center, so it cannot be overlooked. I dropped my car off in a public parking and hurried to the entrance: I knew that there would be special guided tours of the Roman heritage of the monastery at 14:30 and 16:00. Exactly at 14.30 I was at the ticket counter, where I bought a ticket for 9 EUR and immediately joined the tour that had just begun. We first walked outside of the huge monastery building to the entrance of what looked like a cellar. There is nothing left on the surface from Roman times. However, excavations have shown that the Roman camp of Arrianis (as its name probably was) was located on exactly the same grounds as the monastery. The Danube then flowed some 2 kilometers closer than is currently the case. From March to November this year, as part of an exhibition, the Roman excavations under the cloister are also open to visitors - albeit by guided tour only. Here the guide started her explanations at a map of the former army camp. These camps or fortresses were all built according to the same model. Arrianis was not really an important camp, but fulfilled its role in border control against the barbarians on the other side of the Danube. A further room has been turned into a lapidarium (collection of stone objects). Here you can see gravestones that were already reused by the Romans to strengthen a well. 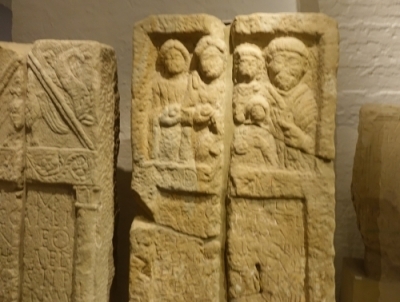 The deceased are depicted on the stones; remarkably often these are Roman men with local, Celtic women. Around the corner of the lapidarium is a unique find in a display case: a Roman military diploma. 2 fragile pieces of bronze served as a kind of identification for 'foreign' soldiers in the auxiliary troops, who had obtained Roman civil rights after 25 years of loyal service. These objects - the gravestones and the diploma - really make clear that this was a Romanized area still with many local connections and far away from Rome. The very last space that we entered during the tour even was a few meters further down. We were now right at the foundations of the monastery. Here excavations from different periods can be seen, including underfloor heating from Roman times. All looked like stone walls to me, but fortunately signs have been added to explain from which period the particular layer of findings stems!